And who could blame them…what with their entire financial system in complete disarray. The Greek situation is a mess, as you’ve probably heard. The government has fallen behind on its payments to creditors and citizens have made a run on the banks. There’s apparently no money left to lend (probably no new mortgages) and maybe very little to withdraw. In fact, the government limited cash withdrawals at ATM machines to 60 Euros per day for Greek residents. Tourists aren’t limited, but with lines around the block and tapped out cash machines, they’re effectively in the same boat. Can’t wait to visit soon! Greeks aren’t allowed to transfer money to foreign accounts either, and there are widespread reports of credit and debit transactions being declined. A Greek once told me (true story) that they didn’t realize you actually had to pay credit cards back, which might explain why they’re in their current dire situation. In a word, it’s a mess and it doesn’t appear to be getting any better unless a deal is made. Given all the chaos, you might be wondering how Greek homeowners are handling the turmoil. As you might expect, more and more Greek homeowners are falling into arrears. Kind of makes sense right? If your country isn’t even making timely payments, why should you? 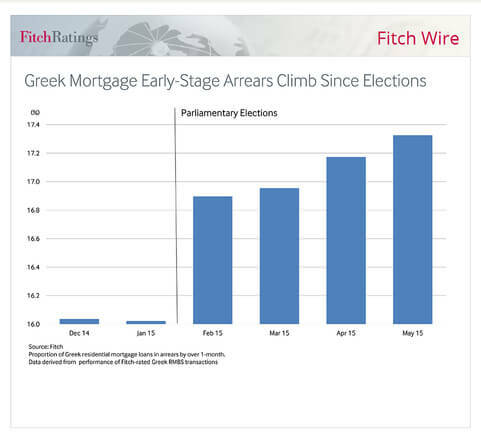 Per a new report from Fitch Ratings, 17.3% of Greek mortgages were at least one month behind as of May. That number is up from 16.9% in February and around 16% in January. And it’s expected to get worse. Additionally, the agency noted that some mortgagors “may already be strategically entering early-stage arrears.” In other words, strategic default, similar to what took place here in the U.S. when borrowers fell deeply underwater on their mortgages. Apparently they’re choosing to make payments on other types of debt because they don’t believe the banks will come after them for their homes. Heck, the banks may not be around in another year, just like the many U.S. financial institutions that got swallowed up during our housing crisis. It’s unclear what would happen to these borrower’s mortgages if Greece were to exit the European Union and return to the drachma, their original currency before the Euro. 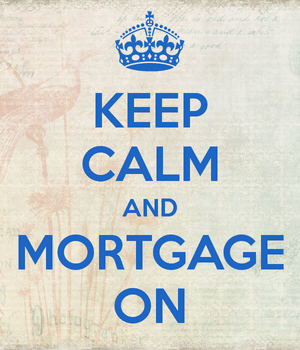 Or what would happen if the banks holding the mortgages fail. But there’s clearly no urgency to keep making payments while uncertainty looms. The good news, for us at least, is that the Greek crisis has pushed mortgage rates lower. Not significantly lower, but back below 2015 highs. As I always say, bad economic news generally leads to lower interest rates. And that seems to have been the case this week as the Greek crisis continues to be front-page news. Unfortunately, it also sent the stock market crashing, so the savings might be awash for some. And the relief might be short-lived if there’s a strong jobs report released tomorrow (early due to the July 4th holiday). Still, a mortgage rate an eight or a quarter of a percent lower will be welcome news to those looking to buy or do a rate and term refinance.